Townships are those communities in South Africa where blacks were forced to relocate by the white minority government during apartheid. 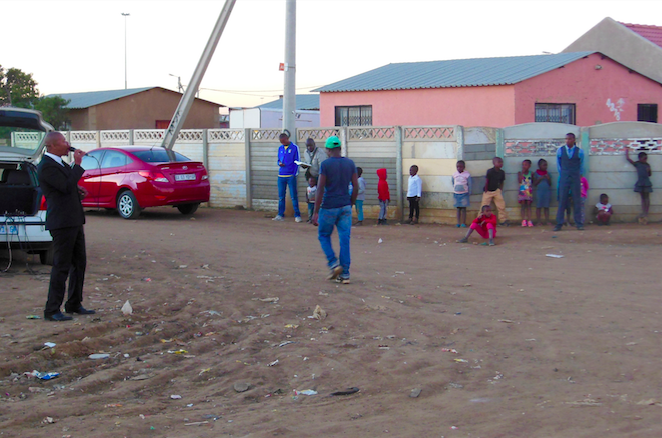 More than two decades after the end of apartheid, townships still tend to be poorer and less privileged than the cities and towns previously developed by whites. It should be quickly noted that no two townships are the same. Some are urban while others are rural. They experience varying degrees of crime and violence. Some contain upper-class areas with very nice homes, while others host vast unplanned settlements with temporary housing. One common factor across all townships is the appalling lack of biblical churches. Most townships have three choices regarding ‘churches’ – mainline denominations that are slowly dying, syncretistic cults that package African traditional religion in Christian language, and of course, the rampant prosperity cult that seems to have a tent or structure on almost every corner. 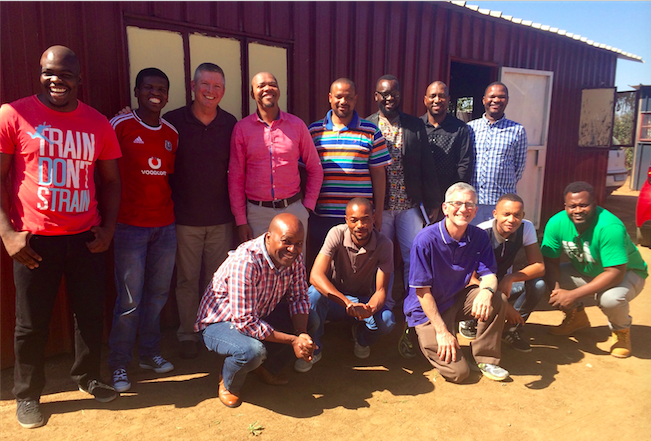 My recent trips to South Africa in April and July were primarily focused on investigating church-planting efforts in the townships, building relationships with these brave black pastors, and exploring how HeartCry could partner with them and strengthen their efforts. I returned from both trips sobered by the challenges, yet excited about the opportunities. In July, my first stop was with our dear brother Mario in Bellville South, Cape Town. 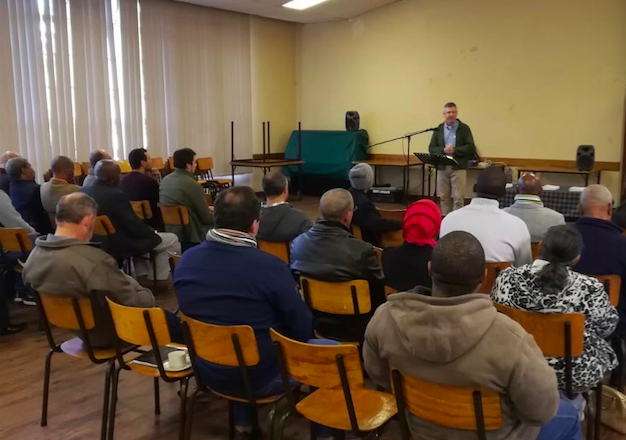 I had the privilege of preaching a Saturday seminar for Pentecostal pastors in Bellville (above right). Mario has been holding these seminars for years and seen fruit in the ministries of these pastors. We looked at atonement accomplished in the cross of Christ, atonement announced in the preaching of the cross, and atonement applied in regeneration. Please pray for continued conformity to biblical truth in these churches. While staying with Mario, I also met some very special young people that have become increasingly attracted to Reformed Faith Mission (left - Theo praying with youth during weekly meeting). These kids come from heartbreaking circumstances. One seventeen year old boy was nearly beaten to death by his father. Another fourteen year old girl was nearly forced into prostitution by her mother for drug money until the church intervened. 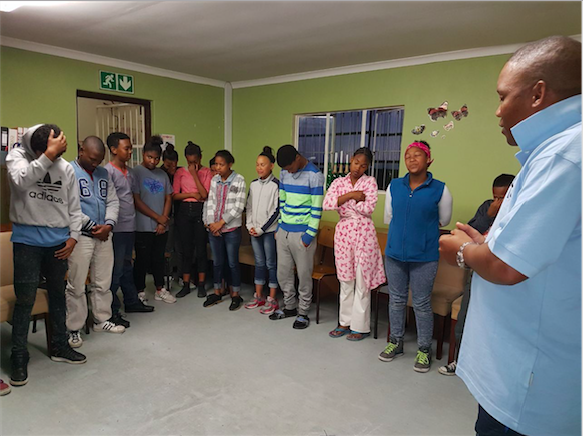 Pastors Mario and Quinton, and the members of Reformed Faith Mission, are exerting great effort to pour the gospel into these young, vulnerable lives. Please pray that the gospel would take root in their souls and bear beautiful fruit in transformed lives. Mario also introduced me to some of the township pastors in their local pastors’ fraternal. These dear brothers have endured much and faithfully labored with limited resources. Please pray with us for wisdom as we put structures in place that would allow us to partner effectively in this needy field. It was also my joy to return to Bloemfontein and visit HeartCry missionaries Richard Raven and Tsholo Kukuni. It was good to talk through all the progress and challenges that Hope Bible Church has experienced this year. 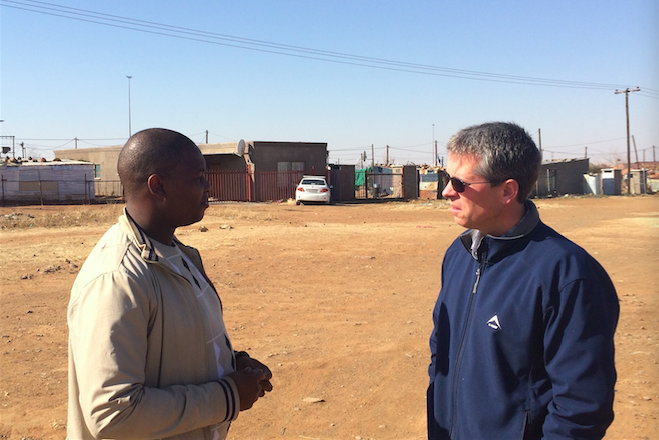 Richard and Tsholo took me on a tour of the townships surrounding Bloemfontein (right). For each of the regions, we discussed the pros and cons of planting a church. Hope Bible has settled on a target community for a future church plant. Please pray as they seek to send a family or establish relationship with a family who can serve as an anchor for evangelistic Bible studies in that community. Finally, I returned to visit Chris Mnguni in Daveyton township, Johannesburg. I first met Chris in April, when I got off the plane and went straight to a street-preaching meeting they were holding (left). Chris is remarkably intentional in evangelism, with daily preaching points in local medical clinics and schools, yet he grieves to see so few conversions. It was exciting to see a plot of land that Chris’s church is purchasing with the help of an established suburban church. This plot is perfectly located across from a new shopping center and will provide them much greater visibility in the community. During that visit, I also had opportunity to meet with several township pastors in the Johannesburg area and spend a day with our newest South African missionary, Bheki Bembe (below right - Bheki and Chris). So many of the township pastors share a story similar to Bheki’s. They were ‘successful’ Charismatic prosperity preachers with growing ‘churches.’ When they attended Bible college or seminary, they were suddenly introduced to sound biblical doctrine. As their doctrinal convictions strengthened, they tried to apply that truth in their ‘churches,’ but were eventually evicted by the ‘mother church.’ These faithful men then started over with nothing and labored to establish biblical churches in their townships. The setbacks have been many and the struggle has been long. Yet our Lord is building His church in these long-neglected communities. 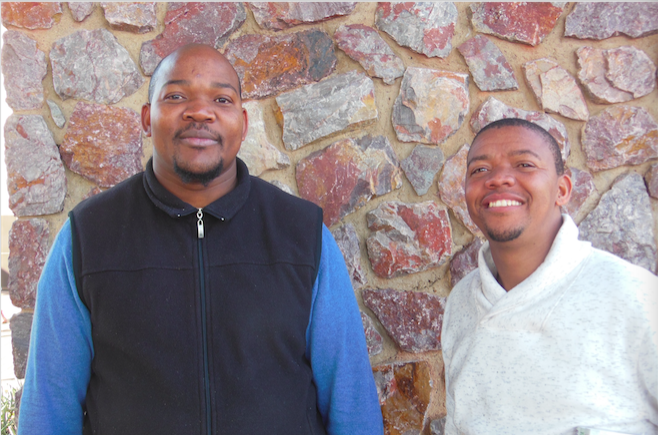 Please pray for these pastors and for strong biblical churches to spread throughout the townships of South Africa.